The 2016 summer horse show season is now in full swing at the Colorado Horse Park with the completion of the Colorado Horse Park FEI CCI ** /FEI CCI* presented by Adequan® – FEI CIC** and Horse Trials. Accuhorsemat, an equine acupressure blanket that promotes healthy circulation and recovery, was the sponsor of the Open Novice eventing division. Acuswede awarded winning riders of the Open Novice division with an Accuhorsemat or Acuswedemat of their own. Based on ancient acupressure practices, the Accuhorsemat stimulates acupuncture points and increases blood flow across the body of the horse to release tension in connective tissue, allowing for more mobility and relieving pain associated with the tightness. After just 15 minutes of using the Accuhorsemat, there is a significant increase in blood flow, which brings more oxygen to the horse’s muscles and promotes healing and recovery. The Accuhorsemat is often used before riding to calm an anxious horse, or to help a horse to loosen up and move more freely. It can also be applied after exercise to relax a horse by soothing muscles and promoting endorphin release. 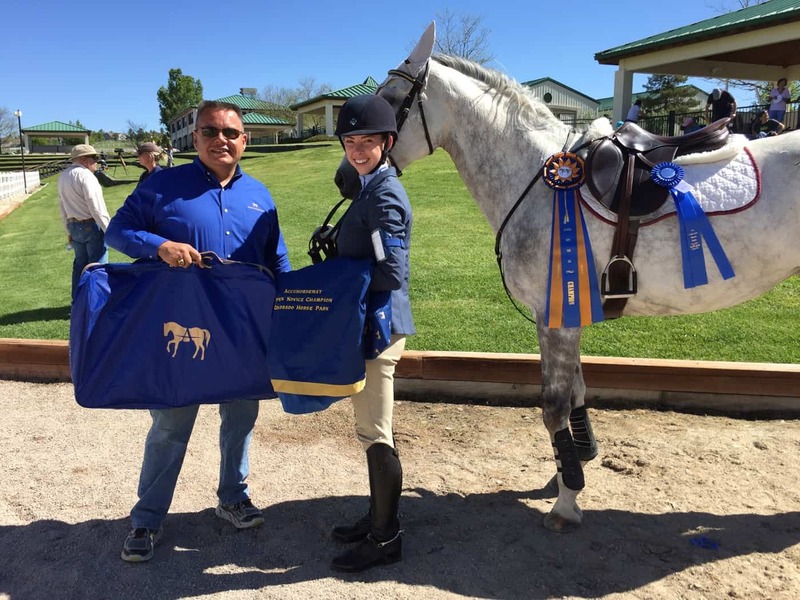 Accuhorsemat is proud to sponsor the Colorado Horse Park as riders come from all over the western United States to compete in the three eventing competitions that will be held throughout the summer at the newly renovated equestrian venue. One of the competitors, Dani Sussman of Larkspur, CO, is also a sponsored rider of Accuhorsemant. Sussman competed three horses in FEI and national classes during the first eventing competition while also helping her students from Aspire Eventing ride to top placing’s. As part of its sponsorship of the Open Novice division, Accuhorsemant awarded the winners of Open Novice Section A, Open Novice Section B, and Novice Rider with Acuswede products, including an Accuhorsemat. The Novice Rider winner, 15-year-old Sophie Wiedenhues on her own Obie Hayv, said, “The weekend went really well for us. Obi was really good in dressage and the cross country was amazing!” Chelsea Luedke, a student of Aspire Eventing, and McGinty’s Irish Rose won the Open Novice A with a score of 33.40, while Lindsey Wagner and her mighty pony, Pioneer, won Open Novice B with a final score of 23.50 against a group of much bigger horses. The Colorado Horse Park is a perfect setting for an equestrian’s dream summer, complete with 11 arenas, miles of trails, a cross country course, and 300 permanent stalls for hunter, jumper, dressage, and eventing disciplines. This year is the inaugural year of the Colorado Horse Park being managed by Equestrian Sport Productions, the successful horse show management organization behind the Winter Equestrian Festival, Adequan Global Dressage Festival, and Tryon International Equestrian Center. For more information about Acuswede and its equine and people products, visit www.acuswede.com. 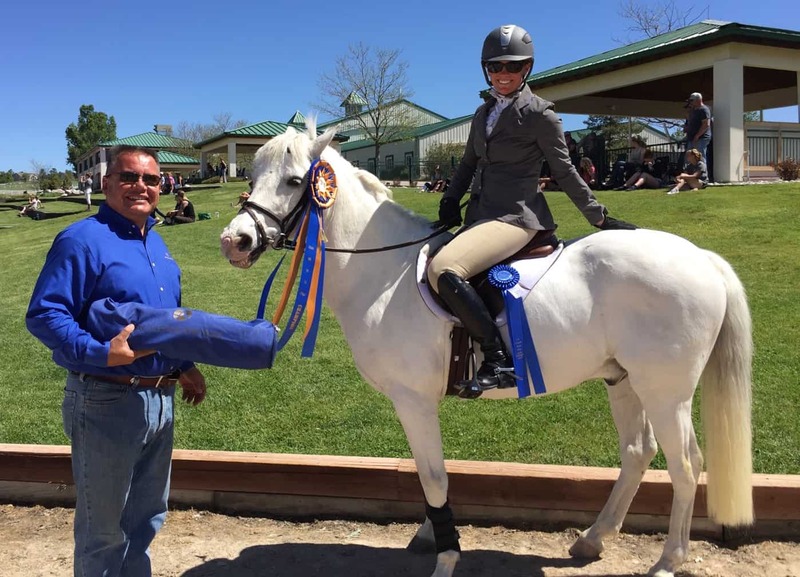 For information about the Equestrian Sport Productions Spring Series, and other shows held at the Colorado Horse Park, please visit http://chp.coth.com. Photo: Novice Rider winner, Sophie Wiedenhues on Obie Hayv, with Thomas Willetto (photo courtesy of Acuswede). 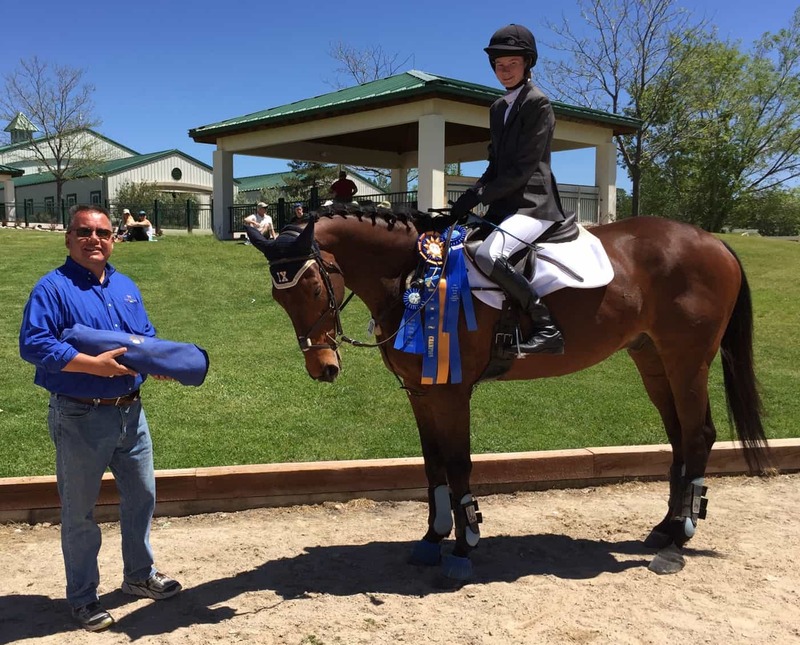 Photo: Lindsey Wagner and her pony, Pioneer, won Open Novice B and an Acuswedemat from Thomas Willetto at the Colorado Horse Park (photo courtesy of Acuswede).